Every successful advisor has one thing in common that continue to keep their business growing. They ensure to keep a healthy stream of leads flowing into their pipeline. How do they do keep the influx of leads coming in? Is it a “secret” they keep safely guarded? 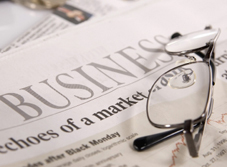 Below are great lead generation tips successful advisors use to stay on top of their game. Network. Join a network within your industry and stay active in local business chapter. Become involved in local seminars that speak to potential prospects. Focus on quality of the network and not the quantity. Concentrate on developing referral partners to work with. Build referrals partners. Build a professional relationship based on trust and reputation with fellow professionals. Ask for recommendations for referrals. Return the favor and see your referrals gain grown. Build your reputation as an industry leader. Get involved and join a local service association that you may enjoy; such as, the local Chamber of Commerce, insurance professional association or even a church. These may not be immediate sales leads, but can be a great source for the long haul. Ask your clients. Ask your existing clients to introduce you to one or two people who fit your client profile. 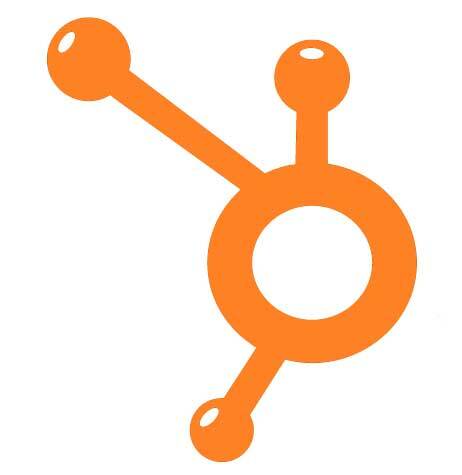 Your client may be your most valuable lead generating asset. Build a foundation. Focused on your goals and develop your personal brand identity: a trusted, well recognizable brand will lead to prospects. Develop and maintain an online presence. Sign up and make good use of social media outlets like Facebook, LinkedIn and Twitter. Be consistent and post valuable information and promote benefits. Tell prospective leads what you can do for them. Learn from your competitors. Look at what they are doing and what has been working for them. Implement those methods onto your own organization. Focus and target your audience. Identify what their needs are. Once this has been determined, then the marketing message and campaigns can be tailored accordingly. Do the same to the other product lines, identify, categorize, customize, and so on. Soon, your hard work will pay-off, and you will see leads building up. Commit and stick to a plan. Commit...Commit…Commit… It can’t be overemphasized. Always stick to your plan and don’t drift away. Advisors can always build life insurance leads through website, emails, telephone calls, and referrals program. Invest in lead programs. Invest in Customer Relationship Management systems (CRM) that help manage an organization current and future customer sales leads. Question: What steps have you taken to build your sales lead? How has it changed your business? Many seniors and people with disabilities who are on traditional Medicare find themselves searching for additional coverage to cover for medical expenses that Medicare does not already cover. More and more of these beneficiaries find the help through private health coverage of Medicare Advantage plans. Seniors choose to enroll in Medicare Advantage plans because these plans provide comprehensive medical coverage, higher-quality care, better services, and additional benefits, reports The Coalition for Medicare Choices, a national grassroots organization who sole purpose is to protect and improve Medicare Advantage. Who’s covered? According to CMC’s website MedicareChoices.org, Medicare Advantage covers over 14 million people nationwide. Out of those 14 million, 41% are blue-collar workers who earn less than $20,000 year, 1 in 5 being minorities. In February 15, 2013, the Centers for Medicare & Medicaid Service enrollment data showed Hawaii, Oregon, Arizona, Pennsylvania, California, Florida, Ohio, Rhode Island, New York, Nevada and Utah as having the highest traditional Medicare beneficiaries enrolled in Medicare Advantage. 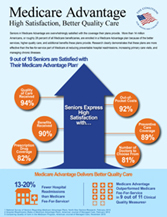 Does Medicare Advantage have high satisfaction and better quality care? In a new survey from The North Star Opinion Research firm commissioned by America’s Health Insurance Plans (AHIP), found 9 out of 10 seniors are satisfied with their Medicare Advantage coverage. It has also been reported that 13 out of 20% of beneficiaries with Medicare Advantage had fewer patient readmissions into hospitals than Medicare fee-for-service, according to the American Journal of Managed Care. The quality of care for seniors under the Medicare Advantage program has improved as well, outperforming Medicare fee-for-service in 9 out of 11 quality measures. Question: Despite the recent government’s budget cuts changes made to Medicare Advantage program, do you feel Medicare Advantage satisfaction and quality measure will decline overtime or will it make it have the opposite effect? Oxford Life Med Supp New Product Release in ID, IL, ND, NV. The Affordable Care Act rollout last week was not all smooth sailing. It faced multitudes of glitches and hiccups online; as well as, offline. Despite its rocky start, the Affordable Care Act aims to reduce the Medicare coverage gap, also known as the "doughnut hole," by 2014 and completely close it by 2020, according to Medicare.gov. Before the Affordable Care Act, benefactors would have to pay their insurance yearly deductible in out-of-pocket cost until their medical expense limit reached the copay of $4500.00, before any coverage premiums would kick in. In 2014, with the Affordable Care Act, beneficiaries begin with the monthly Part D premiums and pays 100% of the drug cost until satisfying the $310 deductible. Then the plan pays for the rest of the cost of the medicine until hitting the expenses cap of $2850.00; a 25% out-of-pocket drop in copay. That’s when seniors are faced with the doughnut hole, once more. The dreaded “doughnut hole” – is the difference seniors out-of-pocket drug expenses begins, after their Part D premiums coverage cap has been exceeded, and before they are eligible for the amount the government pays for "catastrophic" drug coverage. Since 2010, the Medicare gap has been slowly closing through steady drug discounts. This is largely due to the government reaching out to pharmaceutical industry and bargaining for drug discounts. Discounts for brand name drugs and generic will continue. By next year, were expected to pay 47.5% for premium brand pharmaceuticals names and 72% for generic ones. By 2020, Medicare Part D enrollees will save 75% on both premium and generic medication, according to the Centers for Medicare & Medicaid Service. Is the ACA program better than what we had before? Do you think it will truly make Insurance more competitive and affordable? Every business loves to get referrals. Whether they are by word of mouth, email campaigns, an online request form or simply a call, many businesses are unable to convert those referrals to clients despite having an effective marketing plan. One reason referrals fall through the cracks is because many advisors fail to have a referral process in place. The referral process does not need to be complex. It can be an easy process that requires very little work and effort to keep the documentation flow in check. Keep in mind, there is a 24 hour window to initiate contact and to increase your chances to convert them into a client; here’s how to get started… Soon after a referral is received make sure it comes in with all the required contact data; such as, name, telephone number, email address, and request information. Once verified; initiate contact through a telephone call or email to set up a time for an appointment or to simply find out what the referrals needs are. Enter the referral information into a database. This will become very useful to keep track of the referrals relationship with your organization’s business and activities. If the referral came from a professional acquaintance, send them a thank you gift or a personal note, thanking them for the referral. It’s a good business practice to keep in touch with them and give them updates of the referrals status. Don’t give up or disregard the referral if your call or email was unsuccessful the first time around. Make follow-up calls, at least twice a week, until contact has been made or until the referral has decided to become a client. Just remember, the referral process does not have to be complex. It is easy to setup and implement; and has been used by many organizations with success. With a little consistency and patience, any business can benefit by it. How does your business referral process fare? Are there areas that may need improvements?